Ten years ago the 2008 Global Financial Crisis (GFC) shook global capitalism to its core. It was the most severe financial crisis since 1929. The economic and political fallout far surpassed that of the bursting of the dot-com bubble at the turn of the millennium. The free market consensus that had dominated politics since the fall of the Berlin Wall was thrown into crisis. The establishment figures who run capitalism were completely blindsided. Former Chair of the US Federal Reserve and champion of the free market, Alan Greenspan, said, “The worst is over in the financial crisis or will be very soon” in May 2008. But this was just the beginning of the financial collapse. The cataclysm that followed threw the legitimacy of capitalism itself into question. International Monetary Fund adviser Nouriel Roubini paraphrased 19th century German revolutionary Karl Marx in an interview with the Wall Street Journal, saying, “Marx was right about capitalism self-destructing”. A decade on the underlying problems that led to the crisis have not been resolved. A massive expansion of cheap finance and debt has been used to buy a weak recovery. But this only paves the way for the next economic disaster. The 2008 financial crisis was so severe it almost led to the complete collapse of the world banking system. 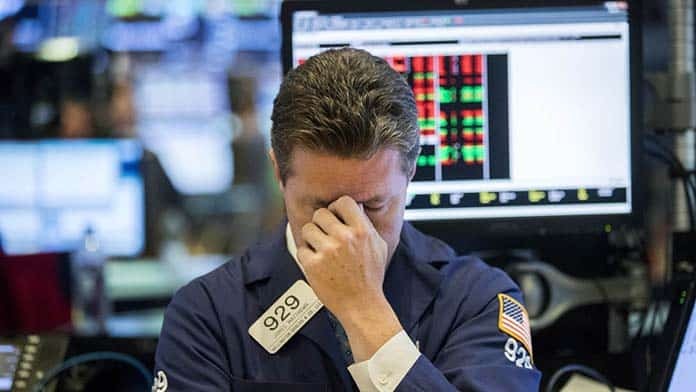 When Lehman Brothers, the world’s fourth largest investment bank, filed for bankruptcy on 15 September 2008, the world economy was brought to the edge of a precipice. This remains the biggest corporate collapse in US history. At the time Lehman had almost $1 trillion in assets and 25,000 employees worldwide. Lehman Brothers was a key player in the financial boom that preceded the crisis. It was at the centre of a web of financial institutions making a fortune by trading in bad debts. The first signs of the crisis began to emerge in 2007 with the sub-prime mortgage crisis. Banks had borrowed huge sums on international markets and used the money to finance so called “sub-prime” mortgages; predatory loans to poor black and working class people who were unable to repay them. The banks that made these dodgy loans then bundled thousands of them together and sold them on to investors. They gave them clever sounding names like “collateralised debt obligations” and “mortgage-backed securities”. They were a time bomb. Immediately before the crisis this bubble of bad debt, the “mortgage bond” market, had swelled to an astronomical $12 trillion Australian. Lehman Brothers was a clearing house for hundreds of thousands of these “financial instruments”. A multitude of other banks depended on Lehman to know who was owed what. When they collapsed the whole banking system began to grind to a halt. The Lehman Brothers collapse burst a much larger financial bubble. Underlying the massive expansion of financial speculation leading up to the GFC was a much deeper crisis of profitability in the capitalist system. Followed the big crisis in 1973 governments around the world adopted neo-liberal policies designed to boost business profits through cutting wages while forcing workers to work harder. This allowed a partial recovery of profit rates. But when the US faced another serious crisis in 2001, the Federal Reserve resorted to slashing interest rates. This produced a wave of cheap debt that fuelled recovery through creating financial bubbles like subprime mortgage loans. But this only delayed the inevitable. The whole house of cards came crashing down in 2008. As Karl Marx explained, capitalism goes through periodic cycles of boom and slump. This is because there is no overall plan for the economy. Companies individually pursue their own short term profit, but the overall effect is anarchy. In a boom companies race to produce goods, hoping to grab a bigger share of the market. But this inevitably leads to over-production. Eventually some companies produce goods that can’t be sold, profits suffer and workers are laid off. This creates a vicious cycle as capitalists stop investing and workers have less money to buy goods. Capitalism has undergone a series of major crises in recent decades, in 1973, 1990-93, 1998 and 2001-2. But the root cause of these crises is what Karl Marx called “the tendency of the rate of profit to fall”. According to Marx, the amount of profit bosses get compared to the cost of their initial investment tends to diminish over time. This is because real economic value comes only from the labour of workers. The wages bosses pay are only a fraction of the value workers produce, the rest is taken as profit. Marx called this profit “surplus value”. But the drive to produce more cheaply and undercut competitors pushes capitalists to invest in more and more complex machinery. While this gives them a short term advantage, when their competitors catch up this advantage is lost. Investment in machinery increases and increases. At the same time, the relative amount of labour that goes into production decreases. Since only labour actually creates “surplus value”, or profit, capitalists get less and less bang for their buck. In order to avert a complete economic meltdown governments in the US and the UK carried out some of the biggest bailouts and nationalisations in world history. They handed out hundreds of billions to the banks. In October 2008 the US passed the Emergency Economic Stabilization Act—a $700 billion bailout. Central banks also slashed interest rates to make borrowing cheaper and began a process called “Quantitative Easing” (QE) on a massive scale. QE pumped more money into the economy through the banks as part of their bailouts. The recovery from the crisis has produced only weak and faltering economic growth. It is only this year that growth rates in the US have returned to pre-crisis levels—and this may not last. The world’s other major economies are still stuck with rates of growth lower than before 2008. The bailouts, QE and interest rate cuts stopped a complete economic collapse. But they also created even larger piles of debt that could led to future crises. And the underlying crisis of profitability remains unresolved. The world economy remains in a “long depression” and vulnerable to future collapse. In October US stock markets fell by 9 per cent in just three weeks. The falls on the Australian stock markets were even bigger over a slightly longer period. In total $346 billion was wiped off e-commerce giant Amazon’s market value. There were further falls in November. These jitters are a sign investors are incredibly jumpy about the future. Although the world economy is still growing, policy makers have started to wind back the flow of cheap credit. The US Federal Reserve has begun increasing official interest rates from the historic low of 0.25 per cent, where they sat for over seven years, to 2.25 per cent today. This makes debts run up since 2008 harder to repay. In November the IMF sounded the alarm about levels of corporate debt. The $1.3 trillion global market for so-called “leveraged loans” is now equivalent to the levels immediately before the 2008 crash. These are loans to companies with weak credit ratings or that are already heavily indebted. They are described as “leveraged debts” because of the companies’ high ratio of debt to assets or earnings. About 70 per cent of these loans are in the US but the debt problem is global. In 2016 the Economist warned that China’s GDP to debt ratio had risen 150 per cent to 260 per cent in a decade. In Australia household debt is 200 per cent of GDP, one of the highest levels in the world. The political instability unleashed since 2008 has only added to the chaos. The far right is on the rise globally, channelling anger at cuts and unemployment against migrants, refugees and minority groups. The victory of far right Presidential candidate Bolsonaro in the Brazilian elections happened against the backdrop of the ongoing economic crisis. Donald Trump’s win in the US Presidential elections has heightened tensions with China and led to a trade war between the world’s two biggest economies. In March Trump placed tariffs on half of China’s exports to the US, leading to retaliatory measures by China. In September there was another escalation, with Trump announcing $277 billion in new trade sanctions on Chinese goods and China hitting back with $83 billion in tariffs on US imports. UBS economists have forecast that the effect of tariffs on the Chinese economy could see up to 1.2 million workers in export related industries lose their jobs. A protracted trade war would have global ramifications. China’s slowdown has already hit other emerging markets like Brazil. The trade war could cost also Australia $36 billion over the next decade according to consultancy firm KPMG. The weak recovery and massive levels of debt, combined with mutually reinforcing political and economic instability is a recipe for the next crisis. Ten years on from the GFC the question is not if, but when. It will be up to the left to shape the response to the already well advanced political polarisation exacerbated by capitalism’s self-destructive tendencies.